14 www.coalage.com October 2018 news continued c a l e n d a r o f e v e n t s In February 2017, JRL acquired the mining rights of an idle mine and wash plant in Coalgood, Kentucky. The mine had been sitting idle since 2012. After the acquisition, entrepreneurs Jou- ko Rissanen, Timothy Lusby, and Roger Lusbyimmediately began preparing the mine to resume operations by acquiring capital equipment, engaging experienced mining and regulatory profes- sionals, and securing long-term supply contracts with regional utility and industrial companies. "After examining the industry, we determined that rising coal prices and a cease on unnecessary federal regulations since the November 2016 presidential election, made the opportunity at- tractive for our long-term investment goals," said Founder and CEO Timothy Lusby. JRL began mining and shipped its first two trains of coal total- ing 25,000 tons of clean coal from its Coalgood, Kentucky, oper- ations as of September 2018, management scaled its mining op- erations and is currently mining and shipping more than 120,000 tons per month. The company recently hired its 200th employee in Harlan County, Kentucky. In related news, JRL Coal was named Business of the Year at the Harlan County Chamber of Commerce's Annual Gala. The award recognizes a business that has contributed and promoted economic growth, stability and improvement in the Harlan County community. "As we started this venture, we wanted to develop a company that would be successful, and also seen as a pillar in the commu- nity. This award represents the strong partnership we have made with the Harlan community," Timothy Lusby said. "What we have been able to achieve would not be possible without the stellar work ethic of the team we have assembled in Harlan. Our team is one of our strongest assets as a company, and I am proud to be a part of such a great organization." JRL Energy conducts both surface and underground min- ing on leasehold interests covering more than 15,000 acres and representing more than 50 million recoverable tons of coal. The company holds 11 coal mining permits issued by the Kentucky Department of Natural Resources, including permits to process and wash coal, dispose of waste and load unit trains. November 6-8, 2018: MetCoke World Summit 2018, Pittsburgh, Penn- sylvania. Contact: Web: www.metcokemarkets.com/metcoke-summit. Janaury 27-30, 2019: 45 th Annual Conference on Explosives and Blasting Techniques, Nashville, Tennessee. Contact: Web: www.isee.org. 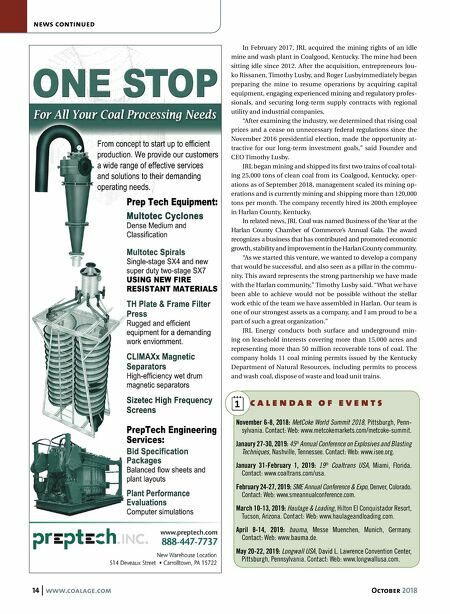 January 31-February 1, 2019: 19 th Coaltrans USA, Miami, Florida. Contact: www.coaltrans.com/usa. February 24-27, 2019: SME Annual Conference & Expo, Denver, Colorado. Contact: Web: www.smeannualconference.com. 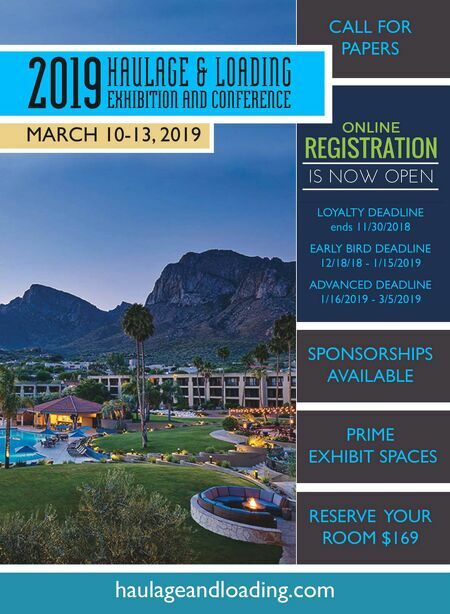 March 10-13, 2019: Haulage & Loading, Hilton El Conquistador Resort, Tucson, Arizona. Contact: Web: www.haulageandloading.com. April 8-14, 2019: bauma, Messe Muenchen, Munich, Germany. Contact: Web: www.bauma.de. May 20-22, 2019: Longwall USA, David L. Lawrence Convention Center, Pittsburgh, Pennsylvania. Contact: Web: www.longwallusa.com.